CARACAS, Venezuela — Architects still call the 45-story skyscraper the Tower of David, after David Brillembourg, the brash financier who built it in the 1990s. The helicopter landing pad on its roof remains intact, a reminder of the airborne limousines that were once supposed to drop bankers off for work. A woman looks out of a crudely constructed cinder block balcony on an upper floor of the “Tower of David.” Squatters live in the bottom 28 floors of the 45-story, uncompleted skyscraper, located in downtown Caracas. The office tower, one of Latin America’s tallest skyscrapers, was meant to be an emblem of Venezuela’s entrepreneurial mettle. But that era is gone. Now, with more than 2,500 squatters making it their home, the building symbolizes something else entirely in this city’s center. 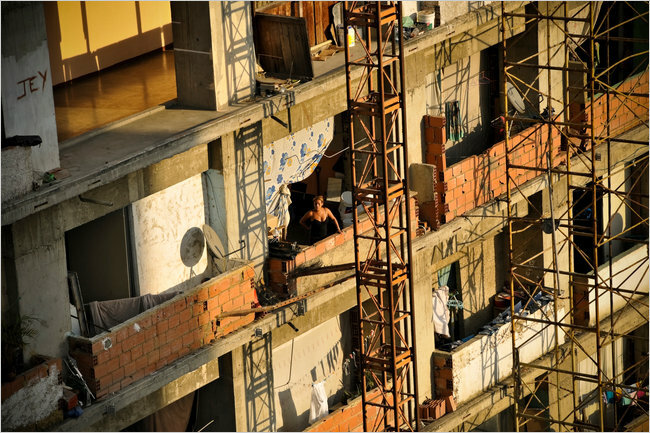 The squatters live in the uncompleted high-rise, which lacks several basic amenities like an elevator. The smell of untreated sewage permeates the corridors. Children scale unlit stairways guided by the glow of cellphones. Some recent arrivals sleep in tents and hammocks. The skyscraper, surrounded by billboards and murals proclaiming the advance of President Hugo Chávez’s“Bolivarian revolution,” is a symbol of the financial crisis that struck the country in the 1990s, the expanded state control over the economy that came after Mr. Chávez took office in 1999 and the housing shortage that has worsened since then, leading to widespread squatter takeovers in this city. Few of the building’s terraces have guardrails. Even walls and windows are absent on many floors. Yet dozens of DirecTV satellite dishes dot the balconies. 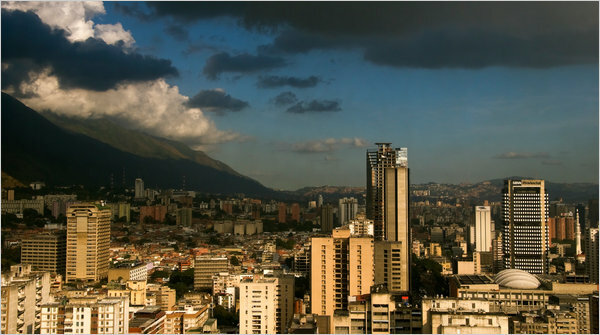 The tower commands some of the most stunning views of Caracas. It contains some of its worst squalor. “I never let my child out of my sight,” said Yeaida Sosa, 29, who lives with her 1-year-old daughter, Dahasi, on the seventh floor overlooking a bustling artery, Avenida Andrés Bello. Ms. Sosa said residents were horrified after a young girl recently fell to her death from a high floor. Some families have walled off their terraces with cinder blocks, blotting out the sun to avoid such tragedies. Others, aware of the risks, prefer to let in the breeze flowing off El Ávila, the emerald green mountain looming over Caracas. “God decides when we enter his kingdom,” said Enrique Zambrano, 22, an electrician who lives on the 19th floor. Mr. Zambrano, like many of the other squatters in the skyscraper, says he is an evangelical Christian. Their pastor is Alexander Daza, 33, a former gang member who found religion in prison. Mr. Daza, commonly known as El Niño, or The Kid, led the occupation of the Tower of David in October 2007. Back then, the building had already been vacant for more than a decade. Its developer, Mr. Brillembourg, a dashing horse breeder, died of cancer at age 56 in 1993, leaving behind hobbled companies. The government absorbed their assets, including the unfinished skyscraper, during a 1994 banking crisis. Robert Neuwirth of New York, the author of “Shadow Cities,” a book about squatter settlements on four continents, said the Tower of David may be the world’s highest squatter building. Once one of Latin America’s most developed cities, Caracas now grapples with an acute housing shortage of about 400,000 units, breeding building invasions. In the area around the Tower of David, squatters have occupied 20 other properties, including the Viasa and Radio Continente towers. White elephants occupying the cityscape, like the Sambil shopping mall close to the Tower of David and seized by the government, now house flood victims. Private construction of housing here has virtually ground to a halt because of fears of government expropriation. The government, hobbled by inefficiency, has built little housing of its own for the poor. The policies toward squatters are also unclear and in flux, effectively allowing many to stay in once empty properties. On occasion, Mr. Chávez has called for squatters to be dislodged. But in January, heurged the poor to occupy unused land in well-heeled parts of Caracas. Then he qualified these remarks by asking them to have “patience” as officials tried to build low-income housing. Many here refuse to wait. The Tower of David stands as a parable of hope for some and of dread for others. Yet squatters, who live on 28 stories and plan to go higher, have created a semblance of order within the skyscraper they now call their own. Sentries with walkie-talkies guard entrances. Each inhabited floor has electricity, jury-rigged to the grid, and water is transported up from the ground floor. or has electricity, jury-rigged to the grid, and water is transported up from the ground floor. Strivers abound in the skyscraper. They chafe at being called “invaders,” the term here for squatters, preferring the less contentious word “neighbor.” A beauty salon operates on one floor. On another, an unlicensed dentist applies the brightly colored braces that are the rage in Caracas street fashion. Almost every floor has a small bodega. Julieth Tilano, 26, lives inside a small shop on the seventh floor with her husband and in-laws. They sell everything from plantains to Pepsi and Belmont cigarettes. Her husband, Humberto Hidalgo, 23, has a side business in which he charges children from the skyscraper 50 cents per half-hour to play PlayStation games on the four television sets in the family’s living room. “There’s opportunity in this tower,” said Mr. Hidalgo, who immigrated here last year from Valledupar, Colombia. Some residents own cars parked in the building’s garage. Others sanguinely point to their trim physiques, a result of going up and down the stairs each day. For others, any roof over one’s head is better than none. That is the view of Jordon Moore, 37, a squatter on the seventh floor whom everyone simply calls “the American.” Mr. Moore, who speaks English with a hint of the West Indies, regales visitors with tales of the “gang life” in Brooklyn, where he says he lived for years, and of an attempt to break into the Venezuelan hip-hop scene that went awry. “I ended up living on the street in this city, and this is better than the street,” he said. A neighbor, José Hernández, 30, agreed. Still, he said he wanted to leave the skyscraper one day. For now, he sleeps with his wife and daughter in one bed under mosquito netting, protection from dengue fever. In his apartment, once meant to be a banker’s corner office, he showed the view, which included a mosque’s minaret and, in the distance, Petare, the patchwork of hillside slums where he grew up. Now Mr. Hernández dons a tie and jacket each day and goes to work at, of all places, a bank. Photography by Meridith Kohut for The New York Times. A version of this article appeared in print on March 1, 2011, on page A6 of the New York edition.